The 100th rule of the famed Rules of Civility and Decent Behavior copied by George Washington as a school boy advised people to “Cleanse not your teeth with the Table Cloth Napkin Fork or Knife but if Others do it let it be done wt. a Pick Tooth.” This advice proved necessary two centuries ago because “the most common means of cleaning teeth was by rubbing them with a cloth dipped in a little salt and water.” As long as this happened away from the dinner table, all would be well regarding propriety. Dental care has improved greatly in 200 years but the seeds of modern tooth care can certainly be seen when looking back to colonial days. Bristle toothbrushes are an age-old invention of the Chinese. Today’s brushes are remarkably similar in shape and design to ones used in centuries past. 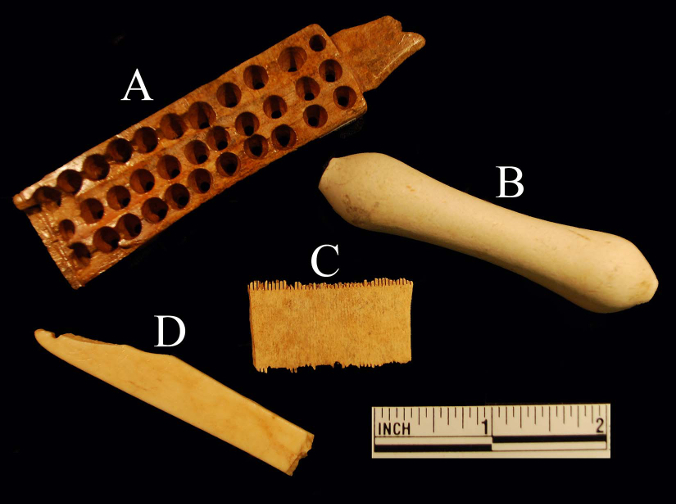 The pig bristle is now nylon and the animal bone is now plastic. 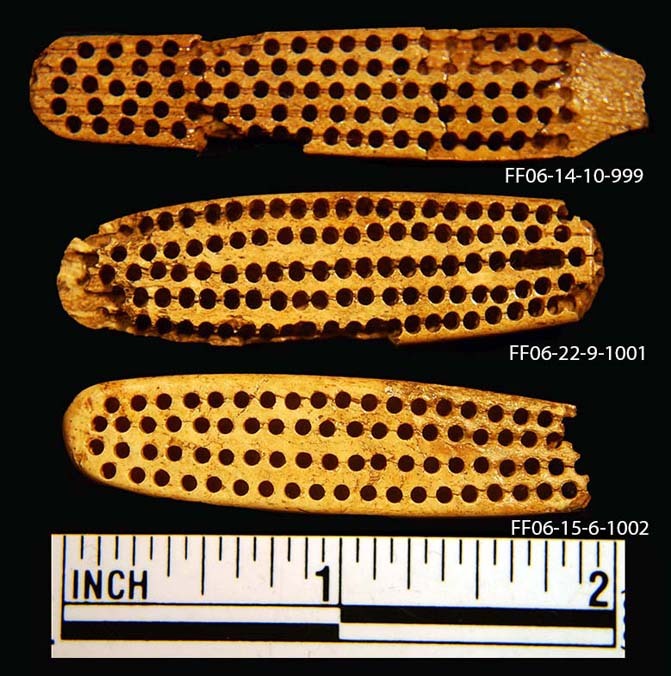 Archaeologists have found bone toothbrush heads — two of which date from the 1820s — during excavations at Ferry Farm. Even without their handles, they look quite familiar even to the modern eye. Bone toothbrush heads excavated by archaeologists at Ferry Farm. Instead of toothpaste, early Americans brushed with tooth powders. To clean teeth, these powders contained abrasives like alum, ground seashells, bone, eggshells, brimstone, baking soda, and even gunpowder. To freshen breath, powders included cinnamon, musk, or dragon’s blood. If dragon’s blood sounds strange, tobacco merchant William Hugh Grove claimed tobacco ashes were “excellent to clean teeth!” These powders were not hard to make yourself and were even available for purchase in cities. On January 2, 1772, ‘surgeon dentist’ John Baker took an ad in the Virginia Gazette “to inform the Gentry that he is now at Mr. Maupin’s, in Williamsburg, and will wait on them.” His ad is worth examining at length for its fascinating glimpse into dental procedures of the time. 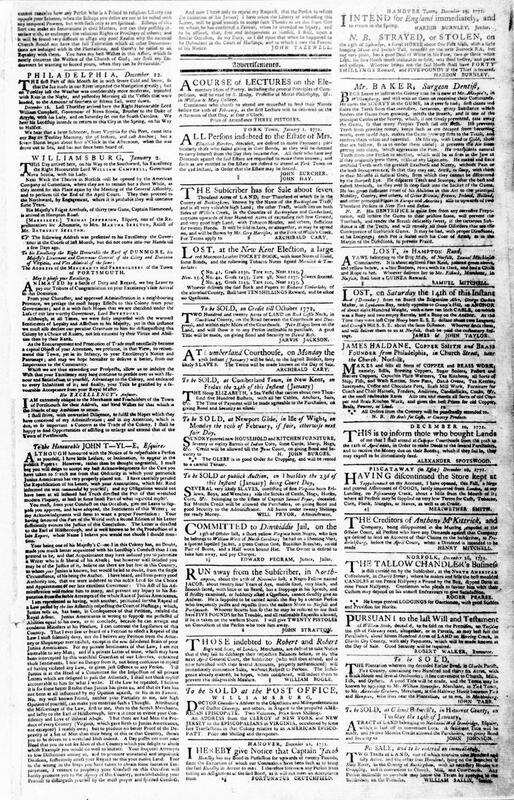 Page 3 of the January 2, 1772 edition of The Virginia Gazette. Baker’s ad is near the top of the far right column. Ostensibly, Baker could cure “the SCURVY in the GUMS, be it ever so bad.” He did so by scrapping from the teeth “that corrosive, tartarous, gritty Substance which hinders the Gums from growing, infects the Breath, and is one of the principal Causes of the Scurvy, which, if not timely prevented, eats away the Gums, so that many Peoples Teeth fall out fresh.” We each have essentially this same procedure performed every six months when we visit the dentist for a cleaning. Surgeon Dentist Baker extracted whole or partial teeth, even if they were “ever so deep sunk into the Socket of the Gums.” Once extracted, the tooth was cleaned of infection and, if necessary, filled. Then, it might be placed back in the same person, into another person, or in a set of dentures. Some teeth even ended up in the archaeological record. 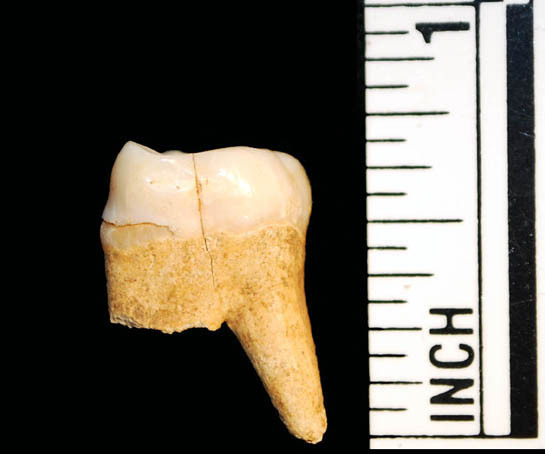 An extracted human tooth was uncovered during excavations at Ferry Farm. From the upper jaw, the tooth belonged to a person of European descent and featured an incredibly large cavity. That said, the nerve was likely dead by the time this tooth was pulled. We know it was pulled because of a broken root. There is no decay from the top of the tooth and it has little wear, indicating it belonged to a younger person. The tooth was discovered in the plow zone, meaning that it could not be dated historically. 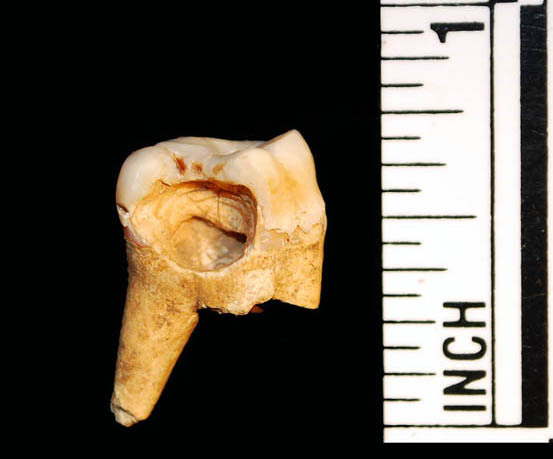 Human tooth excavated at Ferry Farm shows an incredible cavity. Human tooth excavated at Ferry Farm. Using toothbrushes for preventative care, treating gum disease through cleaning, and filling cavities with lead or gold all represent some commonalities between past and present dental care. While seeds of modern dentistry can be traced to the 18th century, significant advances have been made in replacing single teeth and in using dentures. 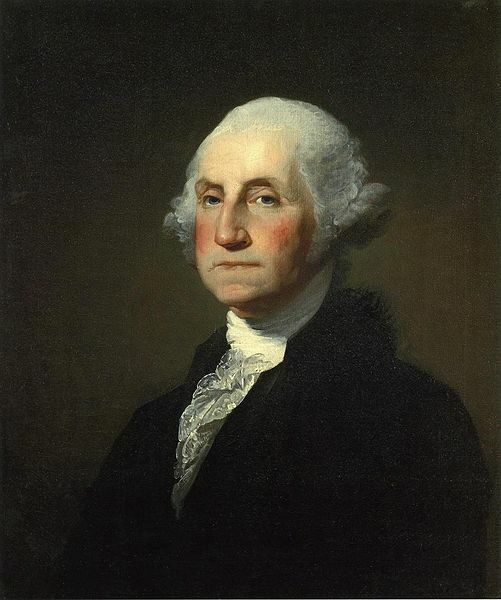 Even if past dentists had some of today’s treatments, however, it seems safe to bet that they still would have been unable to stop the terrible tooth trouble suffered by George Washington throughout his life. 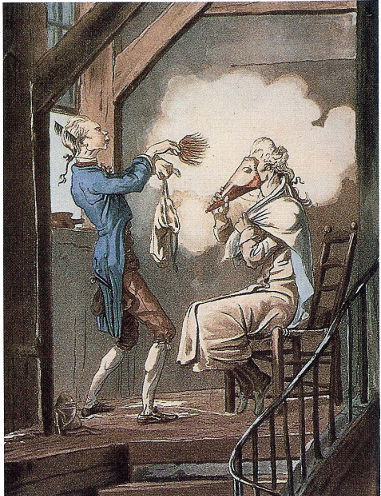 We now have picture of 18th century dentistry. In a future post, we’ll examine George’s famously troublesome teeth. Dorothy A. Mays, Women in Early America: Struggle, Survival, and Freedom in a New World, Santa Barbara, CA: ABC-CLIO, Inc., 2004: 191. Dragon’s blood was a red powder obtain from any of several different plants and used as a folk medicine. The plow zone is the area of soil that is churned up during plowing. This churning destroys soil stratification or layering, which is the first method archaeologists use to date objects. This dating is based on the principle that the deeper an artifact is found in the soil, the older the artifact is. Plowing mixes up the artifacts and makes dating challenging. Editor’s Note: Looking back in time, people’s personal hygiene, fashion choices, medical treatments, and more sometimes look, at the very least, bizarre, if not outright disgusting. When confronted with these weird or gross practices, our first reaction can be to dismiss our ancestors as primitive, ignorant, or just silly. Before such judgments, however, we should try to understand the reasons behind these practices and recognize that our own descendants will judge some of what we do as strange or gross. Here at George Washington’s Ferry Farm and Historic Kenmore, we’ve come to describe our efforts to understand the historically bizarre or disgusting as “Colonial Grossology.” This the second in a series of “Colonial Grossology” posts that we’re offering on Lives & Legacies. At least once during his youth at Ferry Farm, probably in July 1750, George Washington went “washing in the river.” We know this because Ann Carrol and Mary McDaniel were arrested and tried and one of them was even flogged for stealing valuables from his clothes while he was in the Rappahannock. Of course, it seems quite safe to assume that young George swam in the river on many more occasions than this one moment chronicled in court records. The Rappahannock River at George Washington’s Ferry Farm. Document showing the outcome of a court case involving George Washington. Ann Carrol and Mary McDaniel stole valuables from Washington’s clothes while he was “washing in the river.” Carol testified against McDaniel, who was convicted of petty larceny and “flogged fifteen lashes on her bare back.” Spotsylvania County Court Records, Order Book 1749-1755, Central Rappahannock Heritage Center. 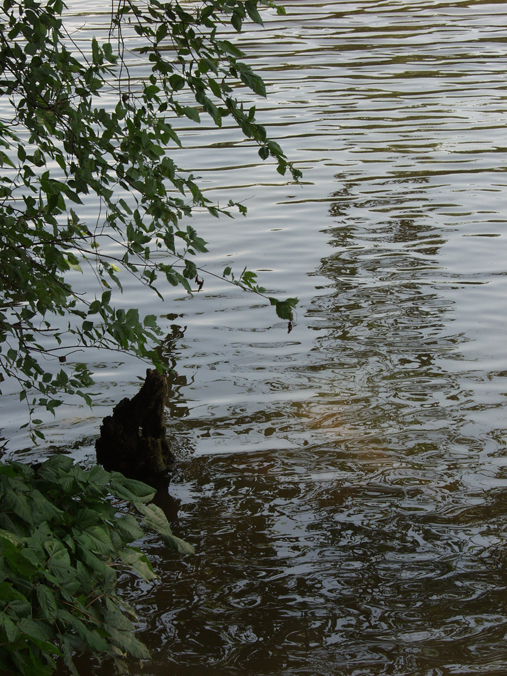 The court records say he was “washing in the river.” But was he bathing to get clean or swimming just for fun? It’s hard to say. In the 1700s, swimming was “rarely intended for hygienic purposes,” though, of course, it made a person clean. Cleaning was not swimming’s intended purpose, however. People went swimming largely to cool off during hot weather. Still, the word “washing” in the court documents seems significant. If Washington was bathing with the purpose of getting clean, his dip in the river was somewhat unusual for more than the fact that he fell victim to thieves. How often did Washington and his fellow colonial Americans bathe to get clean? The question’s answer is more complicated that you might imagine. Second, an immersive bath was simply a lot of hard work. Unless you had servants or owned slaves to do that hard work, you carried water to the tub from your water source, perhaps a well, a spring, or a nearby stream, two buckets at a time. Multiple trips would be necessary. To warm the water, you had to use precious firewood to build a fire. Building the fire and getting it started were not simple tasks either. The incredible effort it took to bathe also explains why, when baths did actually occur, the same water was used by multiple people in the household. The father bathed first, the sons next, then the mother and daughters, and finally the servants. To add to these practical difficulties, “tubs specifically made for bathing did not make an appearance in America” until the very late 18th century. As a result, daily cleaning for most of the colonial era was “accomplished by washing the face and hands . . . in one’s bed chamber, with a basin and a relatively small amount of water.” We today might refer to this method as a sponge bath. 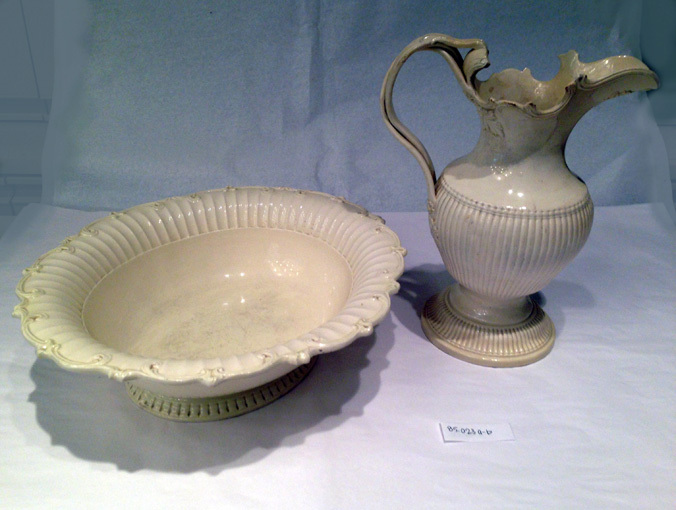 Most early Americans washed daily using water from a pitcher and basin. Ornate sets similar to the one depicted would have been found in the homes of the wealthy like Fielding and Betty Lewis. “A bath in which the entire body was submerged, or showered with water, was generally taken for reasons of pleasure or preventive health maintenance, and in some cases, as a type of remedy for a particular affliction.” Immersive bathing for pleasure and health occurred in resort cities and towns at the sites of warm, mineral springs. For example, George Washington, Fielding Lewis, and kin frequently trekked to Bath, Virginia (now Berkeley Springs, West Virginia) and both gentlemen owned property in the mountain resort. Kathleen M. Brown, Foul Bodies: Cleanliness in Early America, New Haven, CT: Yale University Press, 2009: 19-21. Richard L. Bushman and Claudia L. Bushman, “The Early History of Cleanliness in America,” Journal of American History, Vol. 74, No. 4 (Mar. 1988): 1214.